Home exterior designs play a considerable role in your home’s appearance, so why settle for a plain look? If you want to transform your front door space, boost your home’s curb appeal, or feature a creative and inviting entrance to your home, add a portico. A portico is a small porch protected by a column-supported roof. A portico can offer a way to establish your home’s design, from old-fashioned charm to sleek contemporary. If your space looks drab and needs dimension, a portico is a stylish solution. A portico frames your entry by defining the space and says “come on in”, which is important for homeowners who care about their neighborhood. It also adds value and is attractive to potential home buyers. 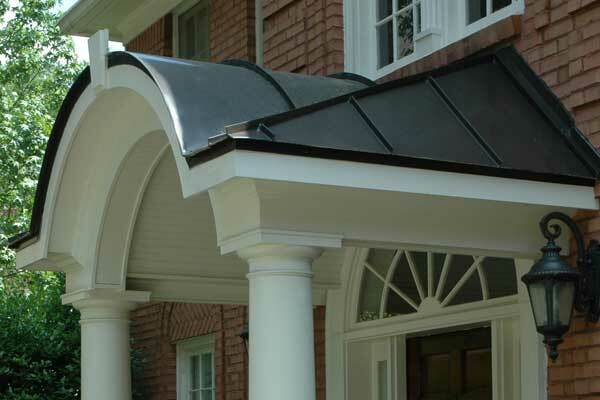 Materials for your portico should be resistant to bad weather, warping from exposure, and insects. Low maintenance wood substitutes include stone piers, composite decking, and fiberglass columns. Keep in mind it should harmonize with your home’s design. Columns are functional and decorative. Columns support the roof and much more. Used for support or added for purely decorative purposes, they are crafted in a variety of materials. 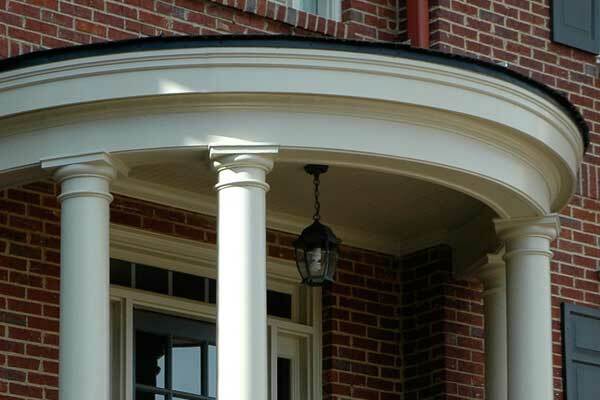 Your new portico columns can be simple or elaborate depending on the size of your front stoop. Make it grand with Doric or Corinthian styles or use spandrels on the columns which add character to smaller homes. You can also refresh an existing space with a non-structural, low maintenance PVC portico column that wraps around your existing columns. Ceilings create a customized look. Unlike a porch, a portico can feature a cathedral ceiling which can make a small space look more expansive. From classic flat to vaulted, there are a menu of options. Tongue and groove, whether painted or stained, is a popular choice. For a more rustic appeal, select an open ceiling with exposed rafters. Create a classic look with a bead board ceiling and even paint it a pale blue-green hue. That’s a Southern tradition! Floors establish style. You may wish to update the existing stoop of your portico, especially since it’s one of the first things your guests will notice. The floor can establish a look for the portico whether you use wide-plank wood decking, concrete, tile, or brick. There are plenty of colors, designs, textures and materials to choose from to help you transform your entry. With railings, the sky’s the limit. Railings come in several designs and materials. The balustrade, which is the entire railing, can be made from a combination of materials and synthetic alternatives such as PVC which is easy to maintain. One of the most popular materials is aluminum, which conveys the historic appeal of iron. Arches or gables? Square colonials benefit from an arched portico addition. Gabled porticos can harmonize with a gabled roof ranch-style home. A second story window over your front door will often dictate the type of shape your new portico will feature. Roof styles offer variety. Porticos can look simple with a small roof, or elaborate with multiple stories and substantial molding details. Create a bold look by using a roofing material that stands out from the main roof. There are many shingle styles to select from (everything from simple to staggered architectural shingles) that can help define your portico’s design. One of the most popular materials is asphalt shingles consisting of a fiberglass mat between two layers of asphalt. Metal roofs are the most durable and resistant to bad weather. Wood shingles and shakes add elegance but may not be the best choice unless they are fire-resistant. State-of-the-art material adds protection. PVC (a low maintenance material) protects all aspects of your portico from columns to balustrades. PVC column wraps, for example, can be installed around an existing structure so if structural posts start to twist, the column wrap will not. Some have the look of painted wood yet they won’t deteriorate like lumber. Embellish your portico. 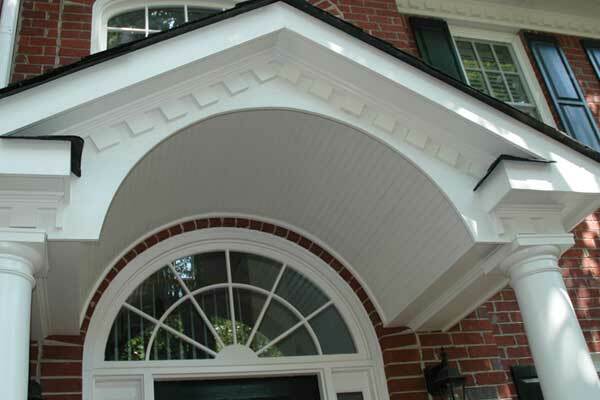 You can enhance your portico’s look by featuring millwork such as dentil or fluted molding, fish-scale or beaded board siding, exposed or open-tail rafters, and embellishments such as friezes, spandrels, and brackets. The Craftsman look is enjoying a huge resurgence and features stone pediments with formidable, stained timber posts. They are even popping up on traditional ranch homes, especially mid-century modern ranches, that are ripe for a fresh, amplified entry. At Georgia Front Porch we focus on providing a quality product with excellent workmanship. Rest assured, we will help you select the best portico design and material to complement your home’s architecture, giving you a structure that’s not only beautiful, but provides outstanding curb appeal that your family, visitors, and neighbors will appreciate for years to come. Contact Gary Zielinski today for a free, no-hassle consultation.